The writing itself has been created by pressing preformed characters into the soft clay which would make this the earliest recorded use of movable type. It is important to note that it was found close to a second tablet with standard writing from this period know as Linear A. Although there has been some controversy over the authenticity of the Disk it is widely believed to be genuine and is on display in the Heraklion Museum of Crete, Greece. Numerous theories have been suggested and range from the Phaistos Disk being a prayer token to a message from ancient aliens. A recent and quite plausible theory is that it was a coded message that was read and then I disposed of by dropping it into the pits. If this is the case it would represent one of the earliest forms of sophisticated encryption. The 45 different symbols represented on the disk seem to have been individually stamped (although some symbols of the same type seem to have been made with different stamps) and the disk then fired. Also, some symbols show evidence of having been erased and re-stamped either with the same symbol or a different one. Unfortunately, no stamps have as yet been found but their use in the manufacture of the disk would suggest other disks were, or were intended to be, made. In addition to the symbols on the disk, there are also dashes and dotted bars impressed in the clay. The dashes or slanted lines seem hand-drawn and always occur under the symbol to the left of the symbols within a group as demarcated by the vertical lines. However, the dashes are not present in every group. Suggestions as to their significance include markers as the start of the word, pre-fixes or suffixes, extra vowels or consonants, verse and stanza dividers, or punctuation marks. Finally, as the lines are irregular in execution and not as carefully marked as the other symbols, it has also been suggested that they are simply accidental marks made during the manufacture process. The dotted lines occur near the outer edge of the spiral on both sides. Suggestions as to their significance include markers of the beginning or end of the text or as chapter markers linking the disk to other disks which together form a continuous text. The significance of the symbols is hotly debated amongst scholars both in terms of what each symbol literally represents and their linguistic meaning. What can be said is that all known writing systems presently fit into one of three categories: pictographies, syllabaries, and alphabets. It has been suggested that the number of different symbols on the disk are too few to be part of a purely pictographic system and too many to be an alphabet. This leaves syllabary as the most likely option – each symbol is a syllable and each group of symbols is a word. Indeed this is the system of the later Mycenaean Linear B. However, in such systems, one would expect to find a reasonably even distribution of symbols within a given text and this is not the case with the two sides of the disk each displaying an uneven distribution of certain symbols. In addition, interpreting the text as a syllabary would rather surprisingly provide no one-syllable words and only 10% would have two syllables. For these reasons, it has been suggested that some of the symbols represent syllables while others represent whole words i.e. : they are pure pictographs. Without any concrete evidence whatsoever, various theories as to the significance of the text on the disk include a hymn to the earth goddess, a court list, an index of religious centres, a letter of greeting, a fertility ritual, and even musical notes. 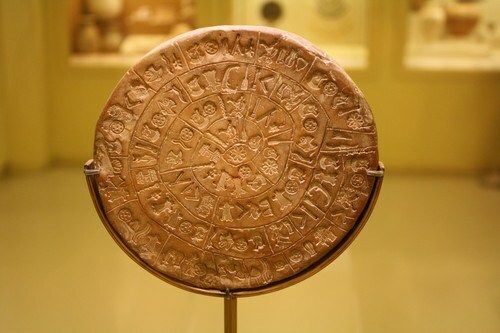 However, unless other disks are found which would give linguists a wider range of text to study or archaeologists discover an equivalent of a Rosetta stone, we must face the likelihood that the Phaistos disk will remain a tantalising mystery which hints at, yet does not reveal, a language that has been lost to us.